Knoco stories: Must you fail in order to learn? Must you fail in order to learn? I was reading an article recently about the role of failure in learning. In which the author said the following. "Every individual has three orientations in encounters with new areas of discovery — avoiding, performing and learning. "Most organizations are performance driven. The employees who perform the best are the ones who are rewarded. Those who try to improve on performance and fail are reprimanded. However, it is only in trying something new that they can improve performance, where new discoveries are made". In this analysis, learning is presented as one of three possibiities and performing is another, and therefore that performing is not learning. Learning is linked here with failing. There is a strong body of thought that says you need to fail, in order to learn. "Experience is the best teacher" and so on. "Take risks, fail, learn". "Trial and error" is often used as a synonym for learning. I know that the writer of the article was contrasting "playing safe" with risk taking and mentioning failure in the context of trying somethign new, and there are many good things in the article, but the contrast of performing with learning is something I would like to challenge. However I think you can learn, and still minimise failure. I think you can learn, and AVOID failure. Here's why. Performing is not an alternative to learning, if you learn from performance. "Performing" should not be seen as in contrast to, or opposed to, learning. Performing and learning go hand in hand. Performance should never be static - no manager should accept performance which is not constantly improving. Static performance is poor performance. The runher who hits their personal best can learn from this an improve further. The organisation that meets their target can learn from this and exceed the target next time. Risk taking, trying new things, and failing are no guarantee of learning. I have seen people take risks, and create their own new solutions, as an alternative to learning from others. I have heard one guy say "I know that factory over there has done this before, but rather than learn from them, I am going to create my own solution. That's what I do - I am an engineer, and my favourite tool is the blank sheet of paper". Informed and strategic risk taking is fine, failing through not learning is stupid. Failure in service of a stretch goal may also be fine, provided there are contingency plans and fallbacks, and also provided you haven't wiped out the company budget or killed someone along the way. Failure because you are too dumb or too lazy or too proud to learn from others before trying something new, is not fine. Risk taking plus learning can avoid failure. Part of the thinking behind the quoted post (that if you don't fail, you won't learn) is based on the assumption that all learning comes from your own personal experience. If you are "learning while doing", you need to feel your way, and mistakes and failures are unavoidable. But what if you "learn before doing"? What if you learn from the failures of others? What if you get us much knowledge as you can before you start? What if you learn from others, hold your Peer Assists, seek out the lessons, learn from your network and community, learn through scenario planning and role play? That way you can get it right first time. 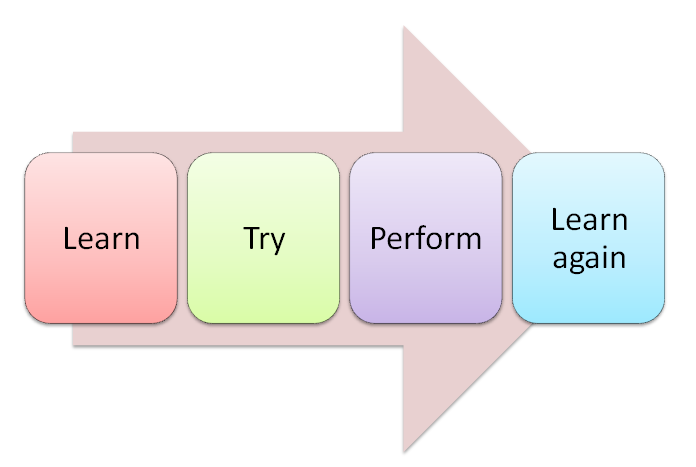 Learn, try, succeed (then learn again) is a far better approach than try, fail, learn (then try again). The first is proactive, the second reactive. Let's sever this implied link between learning and failing. Let's embrace "learning to avoid failure". Let's not punish failure if it is the result of informed risk taking, but lets not expect it either. Let's re-unite learning and performing.